When you get a big bag of chips, you will want something to dip with them. In 1932 , Elmer Doolin had a small restaurant in San Antonio, Texas. One day he was enjoying a pack of crispy fried corn chips with his sandwich when the apple of fate fell on his head. Elmer tracked down the source of the chips and purchased the recipe, nineteen retail accounts and the manufacturing equipment (a converted potato ricer) for the grand sum of $100.00. Mr. Doolin began to manufacture the chips and market them, and they were soon popular and known far and wide as Fritos. In this same time period, Herman Lay over in Nashville, Tennessee was selling foodstuffs for Barrett Food Company. Barrett made Barrett's potato chips. Herman was a whiz-bang salesman, and in 1938 he scraped together enough money to buy out his employer for about eighty grand. Herman pushed the potato chips, and soon they were his best selling product. In 1945 Herman hooked up with Elmer and began to distribute Elmer's Fritos. It was a business connection made in heaven. In 1961 the two companies merged forming Frito-Lay, which now sells a bazillion (a bazillion is more than a kajillion) dollars worth of snack foods every year. Chances are that most any chip you purchase today is a product of Frito-Lay. A couple of memorial moments in the evolution of Frito-Lay include the introduction of Frito's bean dip in 1955 . This was probably the worst thing anybody ever put in a can, but people bought it for the novelty. No one knew anything about making dips back then. In 1965 Ruffles (with ridges) were introduced and have become one of the more popular forms of potato chips. My all-time favorite, Doritos Nacho Cheese Chips, came out in 1972 . To me, nothing says comfort food like a big bag of Doritos. Let's take a quick look at how chips are made. Corn chips like Fritos are made from corn that has been treated with a chemical to soften the husk. The corn is then ground coarsely, formed into chips and fried. There have been a few experiments with baked corn chips, but they never gain much of a following. The corn used is the same as that used to make corn tortillas, but not as fine a grind. Potato chips are simply thin slices of potato fried in oil. Some of the specialty items, like Ruffles, are made by a process that involves reshaping the potato to get a more durable and attractive chip. Again there have been some failed experiments with baking the product. Then there are the tortilla chips we have in our chips and dips section. These are simply tortillas that have been sliced and fried. The shape and seasoning may be different, but they are all the same deep down. Close to the chips section of your favorite supermarket you will find things called "salty snacks". Some of the more popular brands are Saltine, Ritz and Triscuit. These are more crackers than chips, so we will check in on them another time. With so many styles of chips on the market, if you don't already have a favorite, you will just have to shop around until you find the one that is just right for you. For those who do a lot of dipping, the manufacturers have come out with "scoops". These are chips designed like a little spoon to make dipping easier and neater. No one likes a double dipper. When you get a big bag of chips, you will want something to dip with them. Let's start off with everyone's favorite. 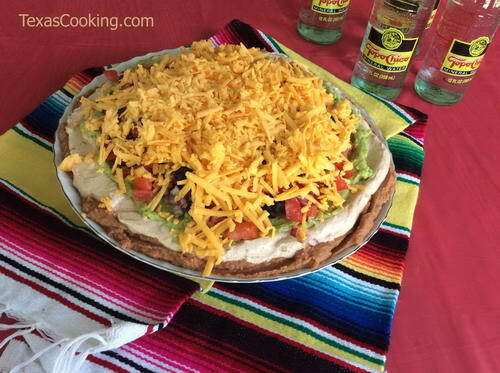 In a suitable dish, layer the ingredients starting with the bean dip, avocados, sour cream, tomatoes, onions, and top with the cheese. Make a day ahead and keep in icebox until about an hour before serving time. Heat oil in skillet and add beans, jalapeños, and garlic powder. Heat, stirring, until beans do not stick to the pan. Spoon mixture into a serving dish and mix with sour cream. Garnish with shredded cheese. Cut cheese into small cubes and place in ovenproof bowl. Microwave cheese until it melts. Stir in the drained tomatoes. Keep warm. Not everything needs a recipe and lots of ingredients. One of the best dips around is simply a big block of cream cheese at room temperature that has been liberally dosed with Tiger Sauce. Tiger Sauce is a hot sauce that comes in a small bottle and is just delicious on most everything. You are not limited to Tiger Sauce; your favorite hot sauce or salsa will work also. We are also not limited to having our chips with sandwiches or just out of the bag. They are great in other ways. One of my very favorite things is a bowl of canned vegetable soup with a handful of original style Fritos crushed into it. Yummm. You can use chips instead of cracker or bread crumbs in many recipes. A hamburger patty with some crushed chips in it is a thing of joy. I suppose you could have chips and ice cream. I haven't tried that yet. A few years ago there was a staple in Texas called Frito Pie. Talk about something good. This was when you could still get a nickel or dime bag of Fritos. These were about a cupful of the chips. You carefully tore open one side of the bag. You put in several spoonfuls of hot chili, some cheese and chopped onion and ate it right out of the bag. Nowadays, a bag of Fritos, small, holds about a half bushel and costs upward of three bucks, but you can still enjoy the Frito Pie recipe served from a bowl.